Annalee Scott plays a character far removed from her inspiration in the LeFanu’s novella! Baron Vordenberg in Carmilla is a nobleman living in genteel poverty whose ancestor once fell in love with a girl, a girl who became a vampire. So tell me about yourself. Who is Annalee Scott? I didn’t always know that I wanted to be an Actress. I spent most of my adolescence playing sports, doing competitive Irish Step Dance, and playing music. However, growing up in Concord Massachusetts, I was constantly surrounded by old homes owned by famous authors and stories of past battles fought during the American Revolution so history and literature have always been a big part of my life. Once I discovered theater I found a way to live inside these stories and influence people with their meanings. I don’t see storytelling as an escape from the world but a way to take a closer look at humanity and purge the emotions we often carry deep within ourselves but cannot easily release. To be immersed in books, movies, and the arts we face ourselves head on and discover our strengths and weaknesses. I graduated from Emerson College with a BA in Theater and a Minor in Dance and despite the decision to pursue my acting career in Los Angeles, which is mainly dominated by the film and television industry, I have been lucky to find fun and interesting theater to busy myself with. Which is why I couldn’t be more thrilled to be a part of this awesome production! How did you come to be involved in this production? Period pieces are my favorite and after reading the breakdown I decided to audition. I’m attracted to dark material and was initially intrigued by the characters and the world they live in. 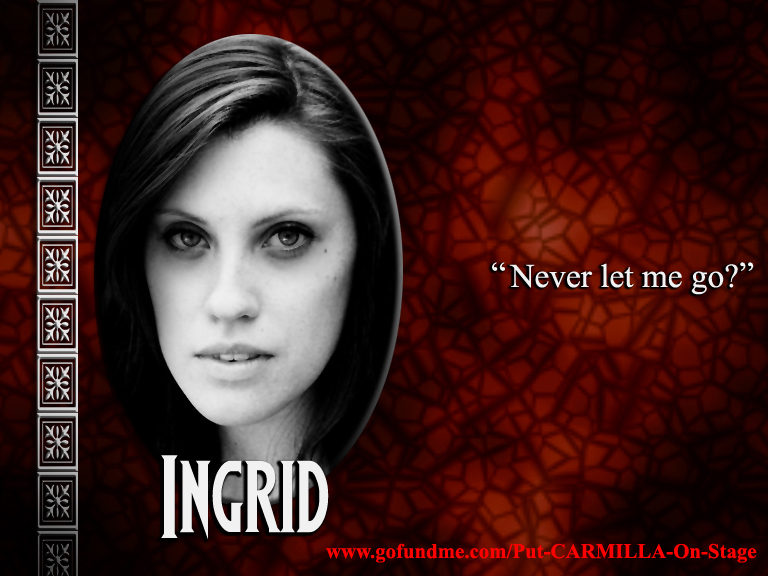 Were you at all familiar with the story of Carmilla before this? Even though period and fantasy pieces are my favorite I’d never heard of this story before. It’s been a treat to learn some of the history surrounding this gothic tale and the effect it might have had on it’s 19th century readers. What about vampires? Interested? Not? Any favorites? People often say I look like Jessica from the HBO show True Blood. If the implication is that I look like a vampire than perhaps secretly I am one. Otherwise, I wish I could say vampires have always been an interest of mine but I’ve only just recently joined the vastly growing fan club. Tell me about your character, Ingrid. Ingrid in my mind represents the masses. She is not the hero of the story but a woman who, even though she is a prominent public figure, tries to blend in with her rapidly changing environment despite its grave implications. She is a survivalist and as the last living member of her noble family does what she can to take care of herself and carry on within her means. Although cautious, she is easily influenced by others giving her a relatable vulnerability that we all feel from time to time. What are your personal hopes in this production, and how do you hope the audience will react? I hope to make people uncomfortable and intrigued. Each of our characters have moments in the story which explore fear and desire sometimes at the same time. I hope people are able to enjoy themselves and be entertained while taking something deeper away, whatever that may be to each individual.